Info "Use the trees to jump higher. Grab bananas, little monkey!" Spunky Monkey is a microgame found in the Nature folder in WarioWare, Inc.: Mega Microgame$!. 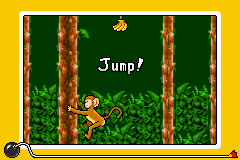 The objective of the game is to help the monkey get bananas by jumping between the two trees. As the difficulty increases, the two trees are further apart. 1st level difficulty: The gap between the trees is relatively narrow, nearly taking up half of the in-game screen's length. 2nd level difficulty: The gap between the trees is 1/4 wider. 3rd level difficulty: The gap between the trees is 1/2 wider. This page was last edited on October 4, 2018, at 20:55.